President Muhammadu Buhari said yesterday that the combined efforts of defectors and their backers in the opposition will not distract his administration from taking actions for the benefit of Nigerians and the development of the country. 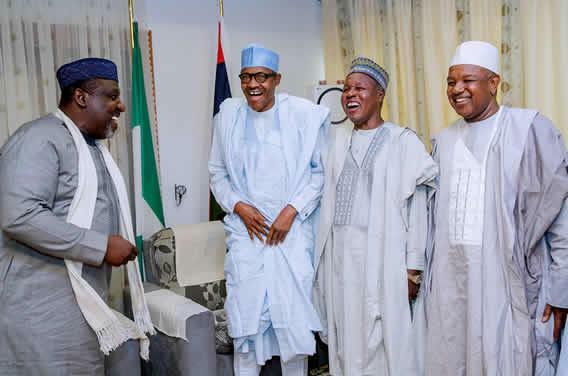 The President spoke when he received five governors of the All Progressives Congress (APC), who paid him Sallah homage at his country home in Daura, Katsina State. He said the ruling APC government had the full understanding of Nigeria’s challenges and is encouraged by the support of Nigerians in addressing them. ‘‘In terms of security, economy and the fight against corruption, we have maintained focus. “Even the opposition, with all their resources, cannot fault our identification of Nigeria’s priorities and the efforts being made to better them. Leader of the delegation and Chairman of the Progressive Governors Forum, Imo State Governor Rochas Okorocha commended the President for his efforts in the keeping the nation together through visionary leadership. He noted that Buhari had remained focused and unshaken by situations and circumstances, adding: ‘‘it shows that your administration is approved by God. ‘‘We are here to encourage you to keep doing what you are doing as Nigerians are very very pleased with you. Okorocha was accompanied by the Governors of Katsina, Kebbi, Kano and Niger states.